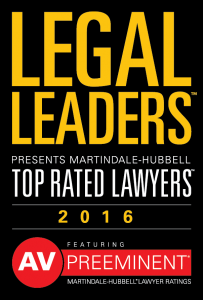 R. Scott Berryman has been selected to the Martindale-Hubbell Georgia’s Top Rated Lawyers of 2016. He earned this selection based on his AV Preeminent rating. This rating demonstrates that an attorney’s peers have ranked him or her at the highest level of professional excellence. His profile can be found here: http://pdfserver.amlaw.com/law/georgia_TRL.pdf. Please scroll down to page 16 for the profile with a link to Scott’s website.